Dandylion only use approved, slow-release fertilisers. The herbicides we apply target only the specific types of weeds prevalent in your lawn. This feed gives your lawn a fast green-up after the rigors of winter. 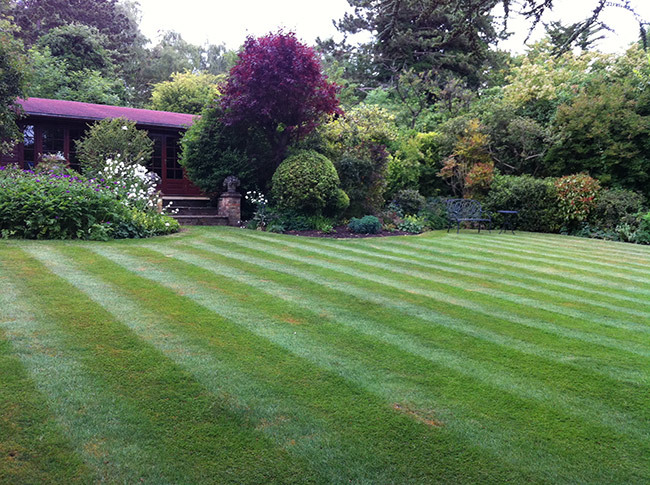 This balance feed will give you this dark green striped lawn that will be the envy of your neighbours. Once conditions are warm enough we spray a selective herbicide directly onto the weeds. As the weeds recede and die back so the lawn will flourish leaving you with a green and weed free lawn. We also include a feed of trace elements necessary for healthy growth. Once applied this fertiliser will feed your lawn and keep it green until the Autumn (rainfall permitting). It will promote a dense green lawn. At this stage we will re- treat any weed spots that remain. An Autumn fertiliser is applied at this time of year to maintain the health and vigor of your lawn prior to the onset on winter. This balance feed will improve root growth and lead to a more drought tolerant lawn next season. We will also re-treat any weed spots that remain. Moss is the biggest threat during this period so we treat it before it harms the grass. This treatment plus additional feed kills the moss and improves the colour of the grass. In fact all lawn experts agree that every lawn should be aerated at least once per year. Thatch is a build up of organic material creating an organic mat on the lawn. This can prevent important nutrients like water and feed reaching the root zone. In summer it impedes proper aeration and restricts the passage of much needed rain. Scarification is the mechanical process of removing this surface thatch from a lawn. It is also used to remove dead moss after treatments have been applied. The lawn may look worse after the treatment but it is an essential part of the renovation process. Scarifying at regular intervals promotes denser growth and helps to ensure you’ll have a vibrant lawn. Aeration is the process where holes/plugs are taken out of the lawn to enable water and air to penetrate beneath the surface, stimulating root growth and aiding compaction. With thatch removed, air, water, nutrients, herbicide and pesticides can do their job. Turf becomes healthier and more resistant to insect damage and disease. Contact us today for a free no obligation quotation to begin your lawn revival! All debris are cleaned up and taken away. Our treatment controls moss on most outdoor external hard surfaces such as footpaths, tennis courts, play areas, walls and driveways etc. We also provide a treatment for established lawn and grassed areas. Moss usually has two growth periods during a year, the first in the autumn after which the plant produces spores during the winter ready to germinate in the spring. The second in the spring when the plant produces spores again ready to germinate in the autumn again thus continuing the cycle. Mosses, like most lawn weeds, primarily take advantage of bare areas but do not kill out existing grass as some people believe. Bare areas in lawn can be result from several causes. Unsuitable grass varieties, poor drainage, drought, soil compaction, excessive shade, thatch accumulation, poor fertility, diseases, improper mowing and other cultural practices are common reasons for turf failure leading to moss or other weed problems. Improving these factors to encourage thick, healthy grass is the key to long term prevention. Grass should preferably be cut for 3 days before treatment and not again until 4 days after. A follow up treatment of vigorous Scarification should take place 2-3 weeks after treatment to remove the dead moss. How we get rid of Chafer Grubs? Grubs show up in well kept lawns for one reason: to fatten themselves up by eating the roots of your grass. Grubs feed underground and out of site. They don’t really care if your grass dies in the process, but we do! Let us prevent these unwelcome dinner guests from causing severe damage and turf loss on your property! Problem: Grubs will feed in the spring and late summer and early autumn. Spring damage is usually not a major concern because spring rains usually mask any damage grubs will do at this time. Late summer and autumn is when the majority of damage will show. Yellowing and brown areas will start to appear in large irregular patches. Because grubs feed on the root system, these patches will pull up easily and may roll up like carpeting. Analysis: Because grubs feed out of sight, by the time damage is evident, it may be too late. The best solution for grubs is to insure they will never do damage in the first place. This is accomplished by applying a product called Merit to your lawn in late spring and summer, before the autumn damage can take place. Merit is a preventative insecticide, which means it must be applied prior to their major feeding activity. Dandylion has applied Merit to many lawns with virtually no grub damage occurring after treatment, thus saving our customers thousands of pounds in turf renovation.